What the heck is that you say? 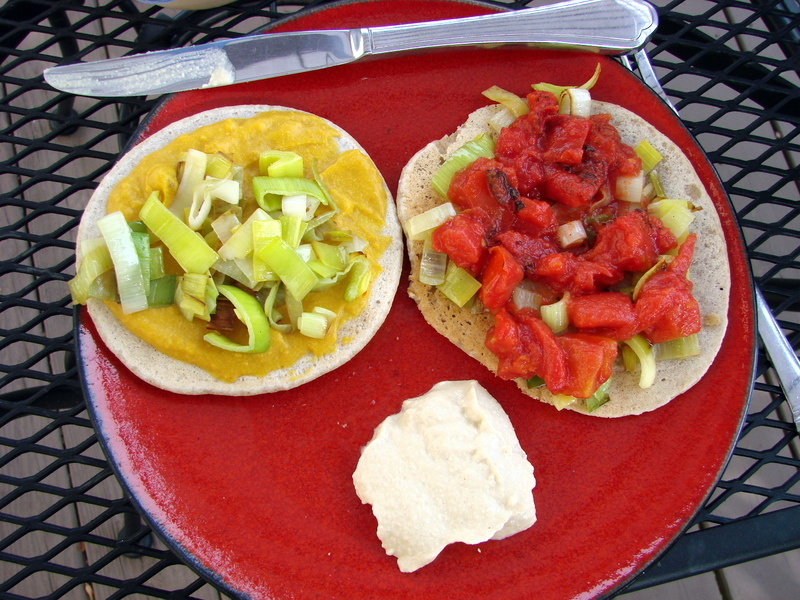 A savory pancake is one make with whole grains (GF version a little later in the post) without vanilla, cinnamon or sugar in the actual pancake which you then top with sauteed or fresh vegetables and sauces or cheeses or even pumpkin sauce that was in the freezer 😉 Admittedly, the pumpkin sauce was in the freezer because it was meant to be an alternative masc & cheese sauce, but nobody liked it that way. I kept thinking there would be some other use for it. But you don’t have to use pumpkin sauce! You can use frozen macaroni and cheese sauce, or salsa, or a little bit of this and a little bit of that. 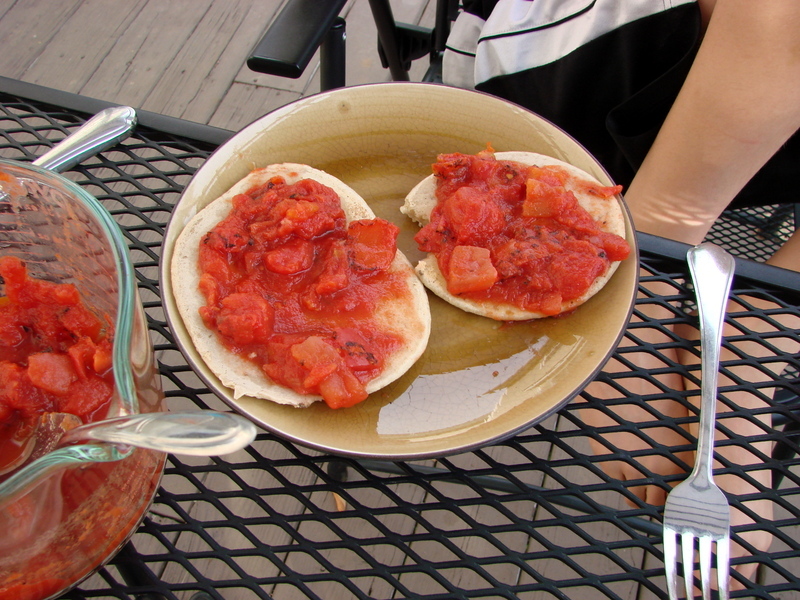 Really any leftovers that would be good with bread would be good on a pancake…. and sauce makes everything nice. Just another way to throw together a healthy meal using whatever bits of this and that you happen to have in the fridge. Little Sis addressed this idea a year ago if you want to see her savory dinnertime pancakes and want a wheat recipe for savory pancakes. Mr. Bigg Sis is gluten free and I am always looking for bread-u-lar bases which are whole grain but gluten free. I came across this recipe for an Uttapam at Vegan Richa – a great source for plant based recipes. Mix with 1 cup rice flour (I used brown). Whisk in about a cup of water to make a flowy batter. Rub minimal oil into heated pan (carefully!!!) Little Sis’ tips for perfect pancake preparation here. 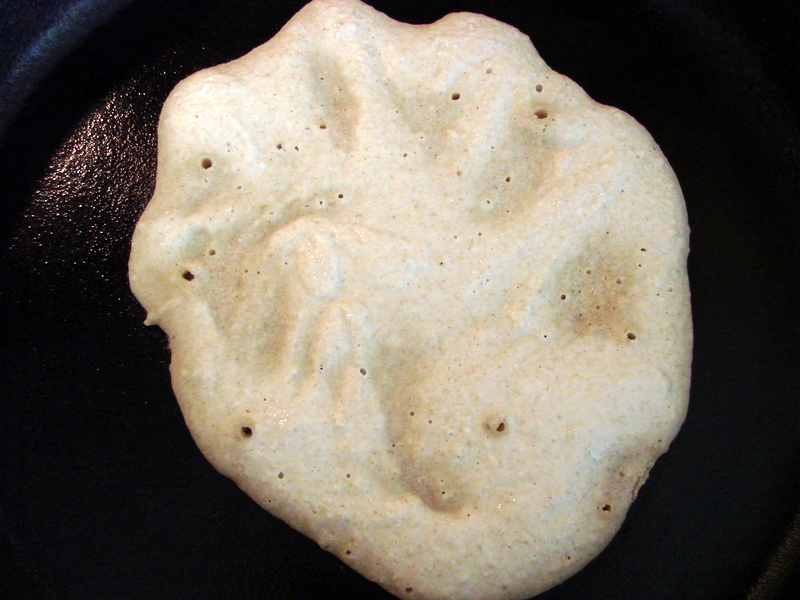 Pour batter into pan, wait for bubbles and flip. They will not be as light and fluffy as gluten-y pancakes, but you could certainly do this with any pancakes. In fact, you could make a large batch of pancakes for breakfast one day, freeze some and use them for dinner a few days later. Really the topping determines the pancake’s personality 🙂 Here are some ideas for alternate sweet toppings for pancakes. 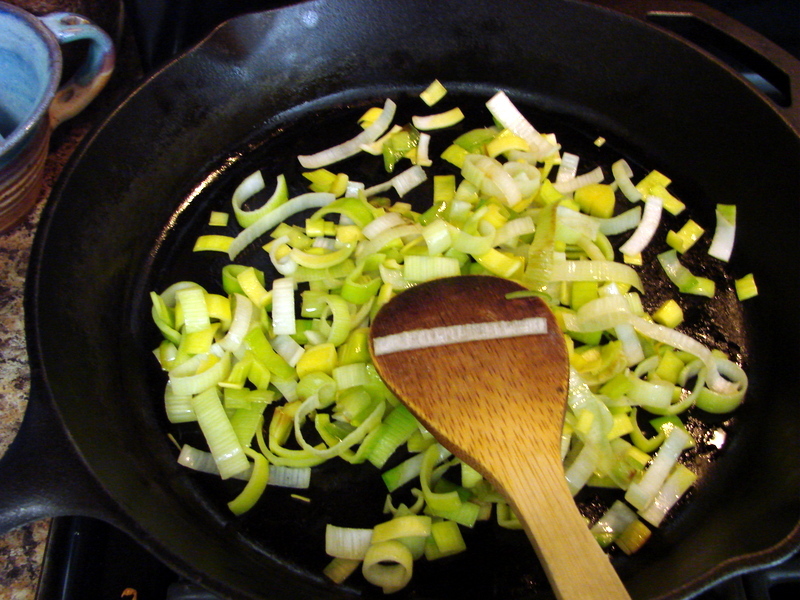 I had some leeks in the fridge – sauteed them up. I also put out some leftover cashew cream which I’ve mentioned before comes from An Unrefined Vegan and is part of a particularly awesome chickpea stew recipe. It was great with both versions. I also use the cashew cream to make delicious mashed potatoes. Predicatably, my son went for the tomatoes alone. Thank Goodness for tomatoes! While it is not always easy to plan a meal, cooking extra when you do cook not only provides cheaper healthier school and work lunches – it often means you have the makings for a cheaper, healthier dinner at home without a lot of fuss. This post was shared at Wildcrafting Wednesday. These look great! Savory food from a normally sweet food–and there is oatmeal too!? I’m in love! Oats are wonderful aren’t they? They are a life saver for the gluten free! This earns my coveted (but little known) Gaaaah Award. Gaaaah happens when you are struck speechless by a delicious recipe. I am speechless to receive an award signifying your speechlessness! Truly I am humbled and that’s a whole lot of not-talking going on. Thank you! I love meals that has no rules. a little of this and a little of this. That is most of my recipe, for me that is, my hubby is a meat and tatter man. I do too. These type of meals are necessary at least once or twice a week to make up for my C+ meal planning skills 😉 Thanks for stopping by! They look so healthy! I’ve never tried leeks before, though they grow in the wild by my house. And your mention of cucumbers makes me want garden fresh produce! Oh my, if you sell your house let me know. Wild leeks, what a grand gift. You must try them! I love this recipe. Thanks for sharing something to yummy! 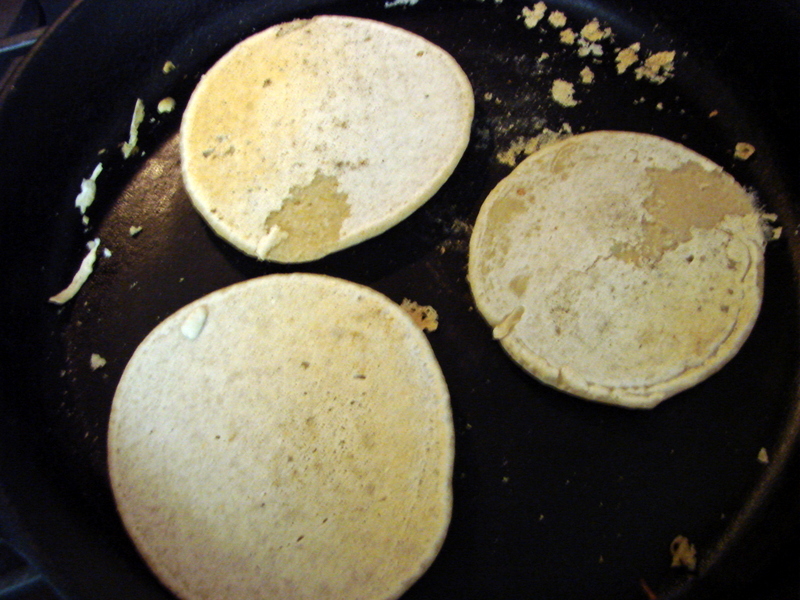 I really like the idea of a savory topping on these delicious pancakes! Thank you for sharing them with the Hearth and Soul hop. Thank you for hosting April! This looks wonderful! And I like that one can freeze them 🙂 Thank you for sharing at our ALL MY BLOGGY FRIENDS party ! Thank you for having us Linda! Freezing and leftovers are a lifesaver in our house. Switching / trying new things can be so hard. 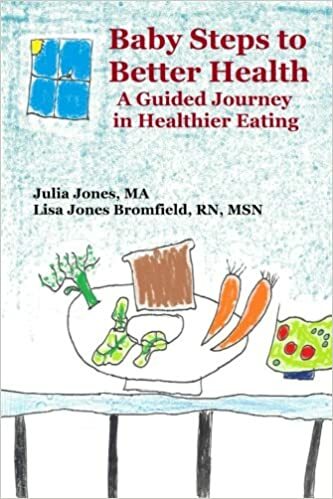 We have some ideas for getting kids on board with food changes in Baby Step #4 ( https://mysisterspantry.wordpress.com/2012/11/20/baby-step-4-adventure-experimentation-and-gratitude/ ) It is a long and arduous battle, isn’t it? Thanks for hosing Tasteful Tuesdays! I know a little girl who would be delighted to have another pancake possibility. Always a pleasure sharing a meal with you Miz Helen. Thanks for the gluten free version. Looks delish!! You’re welcome Tori, and thanks for stopping by! I just made a swiss chard pancake with my french cooking group. I love the idea of savory pancakes. Thanks for sharing this with us on foodie friday. Oooh. That sounds wonderful. I never met a swiss chard recipe I didn’t like! L O V E this! YUM!!! This looks like a wonderful creation. Thanks for sharing at Tuesdays with a Twist at Back to the Basics. Hope to see you again tomorrow! Thank you for having us Mary! We love doing things with a twist and will come back! That is why I like these vague ‘something to combine with veggies’ recipes. Just use what you’ve got! Thank you Cindy for hosting and for the pin!